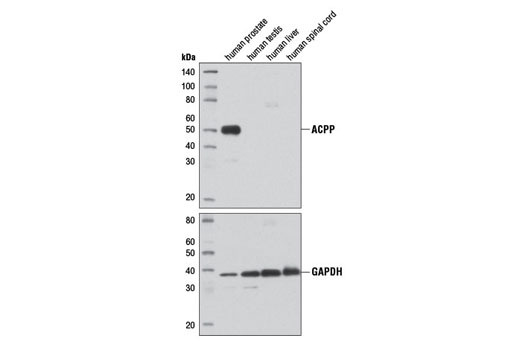 Western blot analysis of extracts from human prostate, testis, liver, and spinal cord using Prostatic Acid Phosphatase (D3Y5P) Rabbit mAb (upper) and GAPDH (D16H11) XP® Rabbit mAb #5174 (lower) demonstrating prostate-specific expression of ACPP. 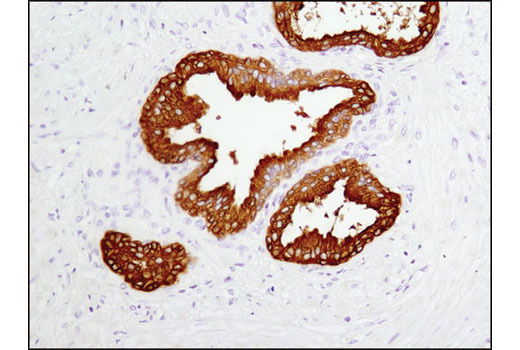 Immunohistochemical analysis of human prostate carcinoma using Prostatic Acid Phosphatase (D3Y5P) Rabbit mAb. Prostatic Acid Phosphatase (D3Y5P) Rabbit mAb recognizes endogenous levels of total ACPP protein. The antibody is predicted to detect both the cellular and secreted isoforms of ACPP. Monoclonal antibody is produced by immunizing animals with recombinant human full-length prostatic acid phosphatase. Prostatic Acid Phosphatase (ACPP or PAP) is a member of the histidine acid phosphatase family. It is a non-specific phosphatase that is capable of dephosphorylating tyrosine residues as well as phospholipids under mildly acidic conditions. ACPP has ecto-5'-nucleotidase activity in pain-sensing neurons where it converts AMP to adenosine, suppressing the pain response (1,2). ACPP occurs as two isoforms that are both heavily glycosylated. The secreted phosphatase (sPAP) is found predominantly in the prostate and seminal plasma, while the cellular isoform (cPAP) is broadly expressed at very low levels and is associated with the plasma and lysosomal membranes (3-5). Cellular PAP has been shown to dephosphorylate ErbB2 at various tyrosine residues effectively terminating signaling (6). Furthermore, the physical interaction between cPAP and ErbB2 appears to regulate androgen sensitivity in prostate cancer cells. Loss of cPAP in androgen-sensitive prostate cancer cells results in the development of a castration-resistant phenotype suggesting that ACPP plays a significant role in prostate cancer cell growth (7). ACPP is expressed in metastatic cells arising from prostate cancer - especially in prostate-derived bone metastasis - suggesting that it may be a relevant diagnostic indicator of prostate cancer re-emergence in bone (8). Street, S.E. et al. (2013) J Neurosci 33, 11314-22. Street, S.E. et al. (2011) Mol Pain 7, 80. Tanaka, M. et al. (2004) FEBS Lett 571, 197-204. Quintero, I.B. et al. (2007) Cancer Res 67, 6549-54. Graddis, T.J. et al. (2011) Int J Clin Exp Pathol 4, 295-306. Chuang, T.D. et al. (2010) J Biol Chem 285, 23598-606. Muniyan, S. et al. (2013) Int J Mol Sci 14, 10438-64. Kirschenbaum, A. et al. (2011) Ann N Y Acad Sci 1237, 64-70.